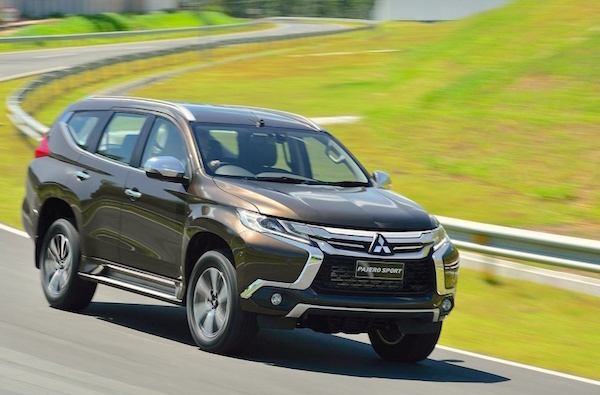 Mitsubishi sales are up 40% year-on-year in October in Thailand. The Thai new light vehicle market is up another splendid 13.1% year-on-year in October to 68.551 registrations, meaning the year-to-date tally is up 11.7% to 689.263 units. Toyota trails the market at +2% to a strong 30.9% share vs. 27.1% so far this year, with Isuzu up 7% to 17.6% and Honda up 19% to 14.1%. Below, Mitsubishi (+40%), Nissan (+44%) and Ford (+38%) impress. Mazda (+14%) and Chevrolet (+19%) also post double digit gains inside the Top 10 while Chinese MG hits a very important milestone this month: the carmaker breaks into the Thai Top 10 for the very first time thanks to deliveries up 26% to 1.2% at #10. Further down, Hyundai (+59%), Kia (+157%) and Ssangyong (+100%) are among the best performers. Model-wise, the Isuzu D-Max continues to surprise and outsells the Toyota Hilux for the 11th consecutive month thanks to sales up 6% to 14.4% share while the Hilux stumbles down 16% to 11.9%. The Toyota Yaris Ativ nudges up one spot to land on the third step of the podium with 5.2% share, up from 4.3% last month. The Ford Ranger is knocked down one rank to #4 in spite of a sturdy 38% rise. The Toyota Yaris is back up 14 spots to #5 but drops 8% year-on-year, distancing Honda City (+25%), Toyota Fortuner (+37%), Mitsubishi Triton (+18%) and Mazda2 (+38%). The Nissan Navara (+22%), Toyota Corolla (+41%), Mitsubishi Attrage (+79%), Pajero Sport (+51%), Mirage (+64%) and Honda CR-V (+224%) all impress. Full October 2017 Top 30 All-brands and Top 70 models below.